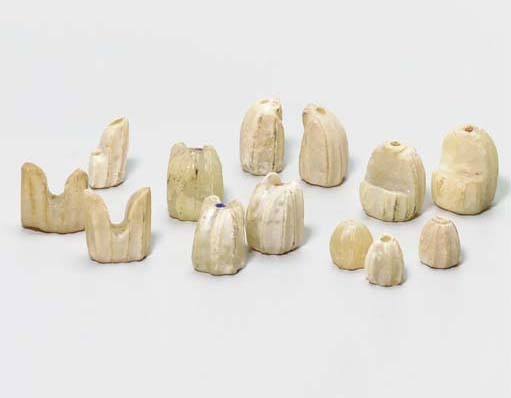 This alabaster chess set is thought to have come from Fatimid Egypt or Syria in the 11th-12th centuries. The largest piece is 3.8cm high, carved from a single piece of alabaster with fluting. 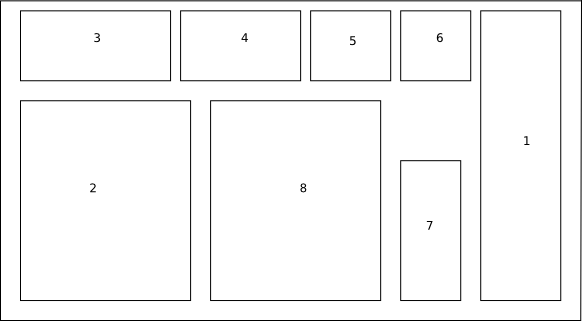 The set has three pawns, two kings (or queens), two knights and two and a half castles (the third is damaged). The sides are differentiated by lapis lazuli and coral insets in the top of the pieces. The pieces were sold by Christies for £59,750 ($86,458). 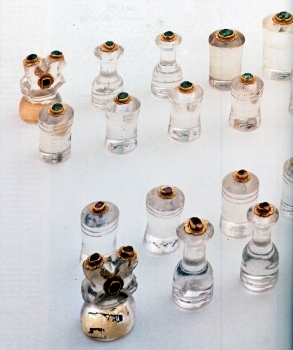 This Ottoman rock crystal chess set is from 16th-17th century. They are stylised, as opposed to Western chess pieces. The height of the king is 40 cm, with one side set with table cut rubies (from Afghanistan or Burma) and the other with emeralds (possibly from the New World), held to the crystal in a lobe mount. Information from Qantara but the set is in the Topkapi Sarayi Museum. 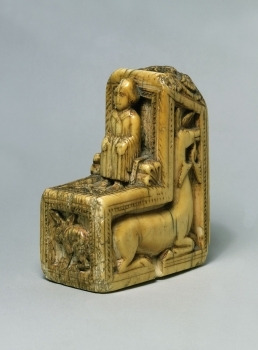 This is an ivory chess piece from the Al-Andalus, 10th to 11th century. 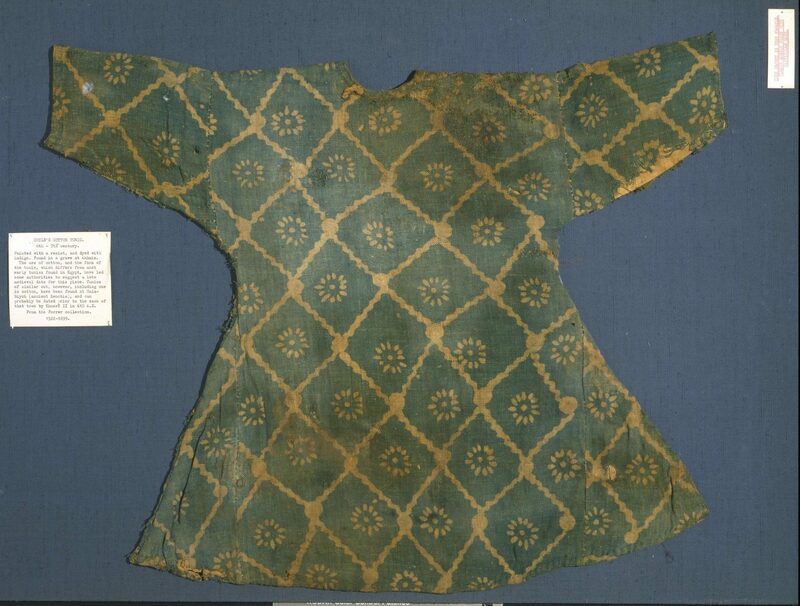 It has a female seated figure in a long tunic. She is sitting on a throne, while the ivory around her has been decorated with a hare and gazelles with palmettes in their mouthes. The piece is in the Dumbarton Oaks Museum in Washington. This set is carved from rock crystal in Egypt in the 10th century. 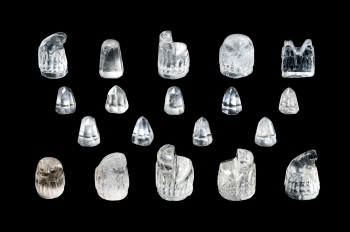 The set is incomplete as pieces were carved according to the crystal available, but the pieces are 2.5–4.5 cm high, 1.9–3.1 cm long with a width of 1.8–3 cm. Taken from Qantara. From Egypt it was exported to Spain, where it ended up in the Collegiata de Àger (via Google Translate). The set has three queens, three bishops, two knights, a castle, ten pawns, and a rook in the shape of a molar. This rook is in the Al Sabah Collection in Kuwait (go to the Jewellery and jewelled objects collection). 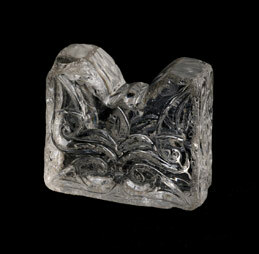 However, this piece is 4.22cm high & 4.75cm wide and thought to be from Iran in the 9th-10th century. Pieces Crystal and Osnabruck Set on Carolus Chess.